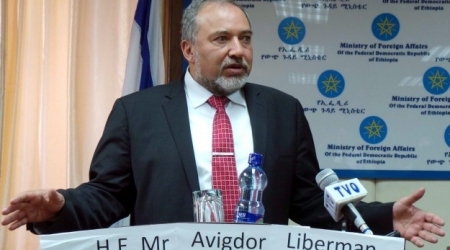 Israeli Foreign Minister and the head of Yisrael Beiteinu Party, Avigdor Lieberman, lashed out at Israel’s Arab citizens, Sunday, threatening to cut their heads off with an axe.’Those who are with us deserve everything, but those who are against us deserve to have their heads chopped off with an axe,’ Lieberman said during an election rally in the western city of Herzliya, according to Al Ray correspondence (Andalou). During Sunday’s rally, Lieberman said that those who raised the black flag of what is called the ‘Nakba Day’ in mourning over the establishment of Israel, did not deserve to belong to the state of Israel. ‘I am quite willing to donate them [the people who raise the black flags] to PA chief Mahmoud Abbas,’ Lieberman said. ‘It would be my pleasure,’ he added. ‘The Palestinians know what is being said about them now in the Arab world,’ Lieberman said.